Careers can evolve in interesting ways, and you never know when an opportunity will arise that ends up leading you down an entirely different path from where you began. 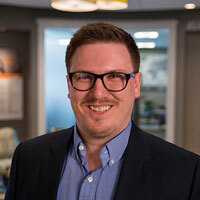 For Cole Bawek, 2016 George Washington University graduate, taking a chance on a new direction has seen him build a successful career in public relations with furniture company Ashley Furniture Industries. Cole was offered a position as public relations specialist, where he helped to produce a range of internal and external communications to highlight company news and events. It didn’t take long to realize he had found his niche, both with Ashley and his career, and he decided to pursue a graduate degree to further develop his skills and pursue leadership opportunities in the department.